Recent data about the automotive market shows that SUVs continue to remain popular and their drivers stay loyal. The study found that more than two-thirds of SUV owners who returned to the market in the first four months of 2017 purchased another new SUV or crossover. Sales data shows that Chevrolet was a strong member of this loyal group. Chevrolet sold 169,842 units in June 2017 and posted gains for the Equinox, Traverse, Trax, Suburban, and Tahoe SUVs. Sales of the popular Chevy Tahoe and Suburban large SUVs rose 6.2% and 7.9%, respectively. DePaula Chevy is posting a banner year for its SUV sales as well. While low gas prices are continuing to make SUVs popular, perhaps part of the allure of owning a Chevy SUV is its history. Did you know that the Chevrolet Suburban was the world’s first SUV? In 1935, Chevy introduced its Suburban, a momentous launch that changed the automotive industry and laid the groundwork for today’s SUV market. It inspired the production of today’s popular SUV models including the Chevy Blazer, Chevy Tahoe, and Chevy Suburban. During those past seven plus decades, the Chevy Suburban has become one of the most beloved vehicles on the market. So popular would the Suburban become that, 82 years later, it still holds the distinguished title of being the world’s oldest continuous automobile nameplate in production and continues to be one of Chevy’s most profitable vehicles. With a focus on functionality, the original concept of the 1935 Suburban was to carry the entire family in a spacious and comfortable three-row vehicle that seated eight and had plenty of cargo space. Chevy engineers based the Suburban on a commercial panel truck but removed the huge, windowless cargo area and added a large passenger compartment. The first vehicle was built specifically for U.S. National Guard units and Civilian Conservation Corps units. Much of the body was constructed from wood and it only had a 90 horsepower engine. It was only after WW II, in 1947 specifically, that subsequent Suburban models received various upgrades, such as flush-mounted headlights, all metal wagon bodies, rear panel doors for easy loading and unloading of luggage, and additional horsepower. During the 1950s, the Suburban gained the option of a V8 engine and four-wheel drive with either a six- or eight-cylinder engine. Style and a more comfortable ride came into being during the 1960 models of the Suburban. A sleeker body, low-profile grille, jet pods with front turn signals, increased glass, and slimmer roof pillars were some of the styling cues that Chevy incorporated into its popular vehicle, as well as a coil spring suspension for better control and ride comfort. Air conditioning and a V8 220 horsepower engine arrived in 1965. By 1970, additional modern conveniences became incorporated into the Suburban like a tilt steering wheel and a stereo radio with eight-track player. In 1973, Chevy completely redesigned the Suburban and gave its interior a dash angled slightly toward the driver and a full-time four-wheel-drive system – ideal for those who lived in areas of the country prone to slippery driving conditions. Taking advantage of lighter materials, Chevy built its Suburban models during the 1980s with new, more aerodynamic sheet metal and reduced its weight by as much as 300 pounds. Finally, in 1992, the Suburbans showed off a sleek new body style and updated interior, along with the use of more glass and a lower step-in height. Safety became a prime asset in the Suburban models in the mid-90s with the addition of a driver side airbag, a passenger side airbag, and a brake/transmission interlock. Near the end of the decade, a “Passlock” theft-deterrent system came on board and disabled the Suburban in case of theft. Suburban owners were given the option to add GM’s OnStar system, which consisted of a cell phone integrated with GPS (Global Positioning Satellites) that linked the driver and vehicle to the OnStar center for directions, roadside assistance or help in an emergency. Entering the new millennium, Chevy gave the Suburban some out-of-this-world luxury features, such as dual power front seats, heated mirrors, and a HomeLink system. In 2007, Chevy gave its historic and iconic Suburban a complete redesign and improved its handling and comfort. Chevy engineers still kept its traditional body-on-frame SUV with a solid rear axle, but improved its aerodynamics. It received a more precise rack-and-pinion system and a coil spring layout. Its interior featured more soft-touch materials and a more contemporary design. Power also increased to 320 horsepower with a 5.3-liter V8 engine and 340 lbs-ft of torque on the half-ton models. The Suburban 2500 got a 6.0-liter V8, packing 350 hp and 360 lbs-ft of torque. Today, the Suburban remains incredibly popular and maintains a special place in the hearts of many U.S. drivers. Experts have put it close to the top of the list of large SUVs. It has come a long way since it was first launched in 1935. Suburban owners step out of their vehicle in luxury and class. It is the preferred vehicle of celebrities, government officials, and sports stars. Why is this the preferential vehicle? Praised for its striking looks, impressive capabilities, and noteworthy luxury, the Suburban’s hushed upscale cabin offers a cushioned ride in its roomy seats and is made with first-rate materials. It’s one of the few large SUVs that offers enough space for adults in the third row. It also has a healthy list of standard features that its rivals just don’t offer. The Suburban comes equipped with all of the upscale amenities that its owners deserve. A huge 8-inch touch-screen infotainment system with sharp graphics and oversized icons gives drivers plenty of room to find what they are looking for. Of course, Apple CarPlay and Android Auto smartphone integration come standard in all models. All of your passengers will each be able to access and utilize their mobile devices due to the Suburban’s built-in Wi-Fi hot spot. And there’s no chance that anyone will be deprived of power since all phones and tablets can be plugged into one of the five USB ports spread around the cabin. 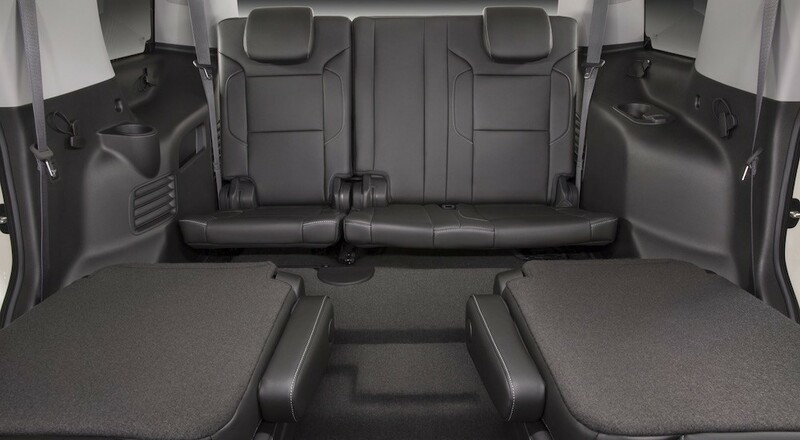 Families needing lots of storage space will enjoy its generous cargo capacity as Chevy can boast that the Suburban has one of the largest in the class. At DePaula Chevy, we are proud to carry one of our most popular vehicles with such a rich history from the Chevrolet brand.